With Amazon now placing even greater pressure on publishers to relinquish control of their own products, just how well the book industry will adapt to the digital media revolution remains an open question. One common prediction, of course, is that books will never become extinct, but rather rarer and more beautiful. While the mass market paperback has yet to evidence such an exotic transformation, the artist’s book may yet be rising to the challenge. Though arguably avant-garde – the crafted interplay of text and material object treating the book itself as a form to be explored, its possibilities extended – the artist’s book is also as democratic as Lulu, often placing the writer at the centre of production and distribution. Over the last several years Lancaster-based poet Sarah Hymas has been building a fine reputation as a maker and purveyor of limited edition poetry art-pamphlets, most recently Lune, runner-up Best Poetry Pamphlet in the 2013 Saboteur Awards, and the well-received Sea Creatures. 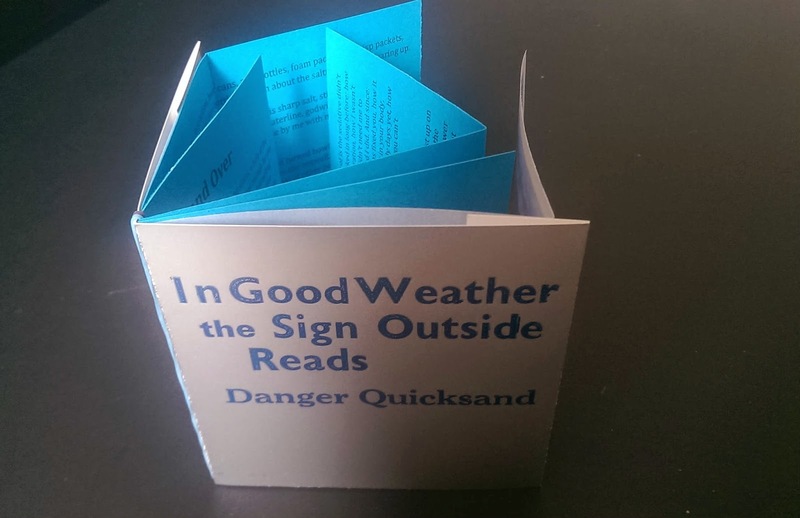 Her latest ingenious offering, In Good Weather the Sign Outside Reads Danger Quicksand, develops her recurrent theme of the sea, launching a flotilla of prose poems that, like the booklet itself, both defy easy categorisation and are larger than they first appear. A sleek silver square bound with elastic bands and stamped with letterpress and maker’s seal, In Good Weather . . . appeals to the hand and ear as much as the eye. Inside, two glassine illustrations and four teal cardboard leaves unfold to reveal a multi-layered meditation on a storm and its aftermath, observations of a high coastal gale merging with the speaker’s reflections on a loved one’s serious operation. There is simple pleasure in the way the book must be twisted and turned to be read, becoming, like a piece of shiny beach flotsam, an object of speculation and surprise. Once read, rather than shelved, it begs to be displayed: open like a crab, closed as triangle or cube, text or illustration to the fore. As physical thing, the book is an elegant delight. The writing impresses too. Whether lyric tetralogy, or four ‘flash chapters’, this account of a relationship weathering threat adroitly meshes natural, medical, and meta-fictional imagery, and anchors its wealth of detail with a taut yet understated line to the heart. The narrative arc is clear, yet travels far, the prose glistens with precise, musical phrases: ‘my view salts to pointillism’; ‘strands of grass lettering the window’; ‘Crab apples nub the browning marsh’. There is an odd slip near the end, when ‘bowling alley’ becomes ‘ally’, but if this is an error it feeds the undercurrent theme of companionship. Overall, and most satisfyingly, form subtly deepens content: the book’s flexible ‘panes’ mirror the window imagery of the early narrative, evoke a surgical wound, and allow for longer lines to trace the speaker’s final beachcombing contemplations. Compact and yet inexhaustible in its treasures, this little book is a hopeful sign that the writer as maker may not just survive, but ride our digital storm. This entry was posted in Book Reviews, Poetry and tagged Artists' Books, Sarah Hymas. Bookmark the permalink. as lovely a description of the book as it must be itself as a tactile and visual object. Thanks Monica – it was an inspiring read! Hasn’t she had fun with her imagery! My pleasure, Sarah! And I hope your lighthouse cottage industry continues to grow!